Cheoy Lee will debut its first-ever 87 Alpha Express Sportbridge yacht at the upcoming Fort Lauderdale International Boat Show. Michael Peters Yacht Design is responsible for the hull design, naval architecture and the exterior styling, while the contemporary interior is by Luiz de Basto, who brought megayacht-inspired interior styling into a smaller package. 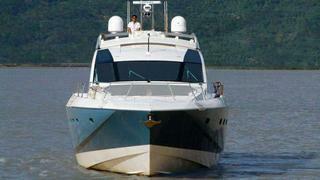 The Alpha 87 Express Sportbridge accommodates eight guests in four cabins, including a full-beam master suite. The Alpha Express series is designed for performance, and the 87 doesn't disappoint – powered by twin 1,900hp C32 Caterpillar ACERTS she is expected to top out at 30-plus knots.